Our printable spring newsletter offers information and resources for children and adults with developmental disabilities and their families. 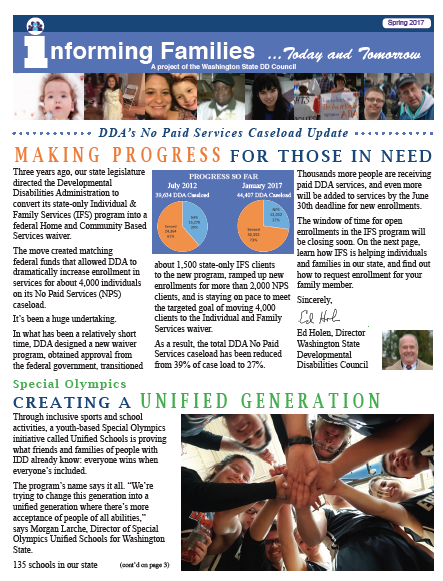 An update on efforts to reduce the numbers of individuals on DDA’s No Paid Services Caseload. Through inclusive sports and school activities, a youth-based Special Olympics initiative called Unified Schools is proving what friends and families of people with I/DD already know: everyone wins when everyone’s included. Learn some of the ways that two key programs help children and adults connect to their communities and increase independence at home. It’s time to start planning for summer activities. Our list of resources can help you get started.